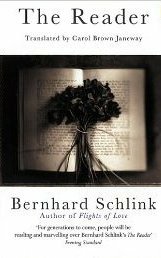 I’m hoping that Bernhard Schlink’s thought-provoking novel The Reader doesn’t become a footnote to Kate Winslet’s Oscar success in the film adaptation. It is an important and enlightening read in so many ways and deserves a far wider readership than simply being “the book of the film” would ever garner it. Each time I read the book I discover something new within its pages or it raises fresh questions: whether it be about how we can go from loving someone to loathing them; why some people cross our paths and whether or not this is fate, together with what the lasting impact they have on our lives; or by forcing me to look at what people are capable of doing under extreme circumstances, be they good or bad.